Chiclana city centre is only 5 minutes away from Cortijo de los Flamingos. Andalusian style, with narrow streets and courtyards full of flowers. The population of Chiclana is 84 200 (in 2015). Chiclana was successively colonized by the Phoenicians, the Greeks and the Romans and was located in the upper Middle Ages on the border (in Spanish, “frontera”), between the Muslim and Christian states. 7 magical places of Chiclana – this touristic route was created to celebrate 7th century of the town – which were chosen for their dramatic views and great historical importance. The most important monument in the history of Chiclana would be the most famous temple in the Old Times – temple of Hercules – Melkart. It existed in the times of the Phoenicians and Romans on the little island of Sancti Petri. On its site the Castle of Sancti Petri was build in XVIII century. It is a magical view at the time of spring and autumn when the sun sets just behind the tower. Ermita de Santa Ana a hermitage from the 18th century standing on a hill. It is probably the most representative building in town. Due to its position it can be seen from miles away. Great views can be enjoyed from there over Chiclana, the Bahía de Cádiz, the coast and sea. The tower was used as a lookout point in case of Vikings and Moors attacks. La Loma de Puerco where the battle of Chiclana took place in 1811 during the war against Napoleon. The Wetlands including the salt marches were always very important areas for the Chiclaneros because of salt, fish and see food. You can see them from Roof Terrace in Cortijo de los Flamingos. The Miralmar is located on a hill, just off the road to Conil. From here, there are great views to Chiclana. You can see the Atlantic Ocean, the bay and all the surrounding area. 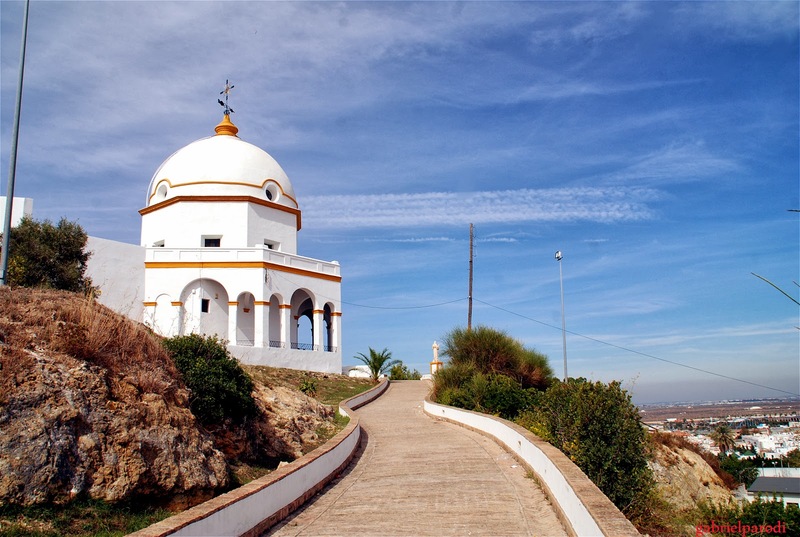 El Carrascal – you can see the 3000-year-old town of Medina Sidonia and inland landscape. La Espartosa – the whole area looks as if it has been untouched by time. It’s completely unspoilt, is covered with carob trees, cork oaks and dwarf evergreens. The centre of Chiclana is located around the town hall square and the covered market (Mercado de los Abastos on la Plaza de las Bodegas) which is bustling and lively every day. 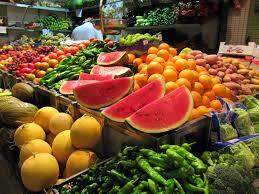 The market has an array of fruit and vegetables, fish and meat stalls. On Tuesday’s mornings there is also a large outdoor market located by the blue bridge across the river. Cádiz is only 20 minutes away from Cortijo de los Flamingos. This port city is almost entirely surrounded by water. It is connected to the mainland only by a thin strip of land. This city beats to the rhythm of the waves along its shores. With its promenades , seaport alleys and a zesty yet easy-going approach to life, it is a city with a distinctively marine flavour. This is a place where music, laughter and chatter constantly fill the sea air. 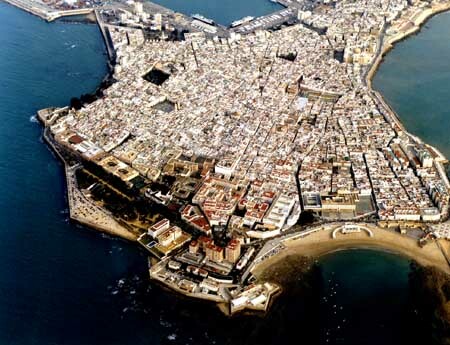 The oldest part of Cádiz, within remnants of the city walls, is called Casco Antiguo, the Historical Quarter. It is particularly beautiful, with an old world charm. The different barrios (Spanish quarters) play a strong part in giving the old town its distinctive personality and flavour. There is the El Populo district, which is originally an old medieval village from where Christopher Columbus was leaving on his second trip in 1493. The El Populo quarter is filled with narrow alleyways and craggy, weather-beaten palaces, a place where you can take a leisurely walk while munching on some fried fish and squid. In 1980 there was a fire in Polpulo district causing catastrophic damage. In the aftermath of the fire, en existing discovery was made – the remains of an ancient Roman theatre. The original theatre was constructed by order of Lucius Cornelius Balbus during the 1st century BC. It is the second largest Roman theatre in the world. La Viña, a fishing district, and the Santa Maria quarter – which is where you will find flamenco singing at its best. When exploring Casco Antiguo, be sure not to miss the Baroque Cathedral – a majestic structure with an impressive golden dome. It sits on the side of an older cathedral, completed in 1260. After burning down in 1596 the reconstruction started in 1776 – as a result the cathedral was build over a period of 116 years. That is the reason why you can find various styles there. The quaint and pretty plazas are perfect places to sit and relax, while sipping a nice copita de Xerez, famous shery produced in Jerez de la Frontera. The squares have their own distinct style, such as the San Juan de Dios, the España, Mina, Consituction and Mentidero. These streets and plazas are lined by trees, said to be brought back by Columbus. All in all, Cadiz is a perfect place to meander along and discover the treasures it has to offer. Cross the Puerta Tierra, the gateway of the remains of the city hall, and you enter into a more modern atmosphere. Gaditanos, as the locals are called, are fun-loving. They love to party – and how! The Cadiz Carnival is probably one of the most exciting and colourful events in the region. People in bright costumes flock the streets. Singing, dancing and general revelry can be found everywhere. 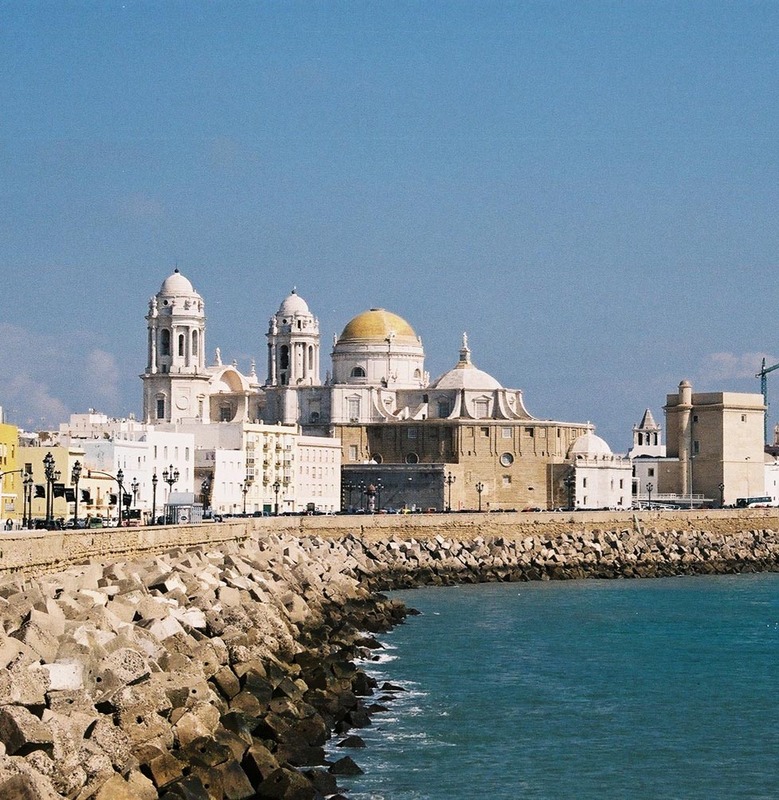 Cadiz, Spain is a thoroughly enchanting city; even during these modern times, it has still managed to retain its sense of history, character and authenticity. Sevilla is only about an hour away from Cortijo de los Flamingos. Here in the region’s capital and biggest city, that special Andalucian way of life is distilled into its purest and most intense form. It’s the home of those two most famous Andalucian traditions: flamenco and bullfighting. Sevilla is where Carmen rolled cigars on her tights and loved torero, where Don Juan seduced young Señoritas in times long gone, and where Cervantes and Columbus drank sherry. 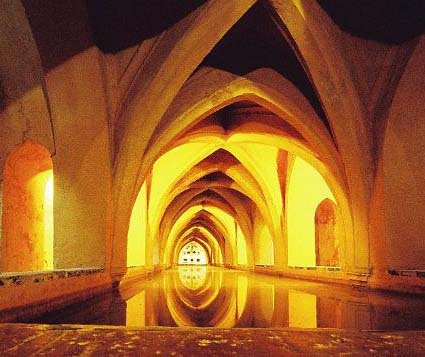 There are many places of interest in Sevilla but some of them are the must. Sevilla’s spectacular gothic cathedral is one of the biggest in the world. It was built between 1402 and 1506 on the site of XII century Almohad mosque with the mosque’s minaret (the Giralda) still beside it. 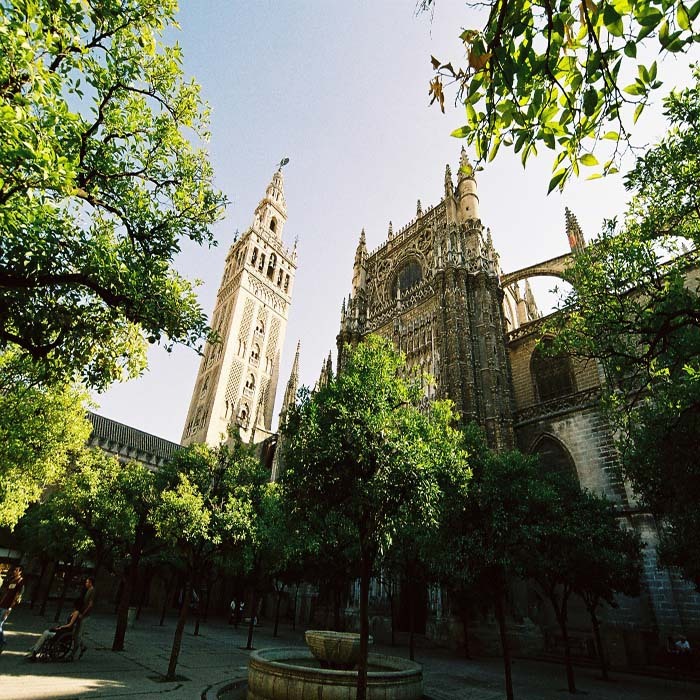 The climb up the Giralda, approximately 70 meters, is made easier with the absence of stairs. Instead a series of ramps leads you to the top for a perfect view of the city. Inside are works of by Murillo, Goya, Pedro de Campaña and Luis de Vargas. Sculpture includes works by Martinez Montañés. The tomb of Columbus is said to be located here as well. Alcázar, the Royal Palace, the World Heritage monuments stands south of the cathedral across Plaza del Triunfo. It is still a vacation spot for the King and Queen. Construction first began under Abd Al Ramán III in the early 10th century and has been expanded and reconstructed many times during its 11 century existence. With its intricate designs and elaborate architectural forms, this impressive and original example of the Mudéjar style is not to be missed. Sevilla is home to one of Spain’s most prestigious and well-recognized bullfighting rings – the Maestranza. The Plaza de Toros was constructed over several decades during the 18th century and is one of the most famous venues in all of Spain to take in a bullfight. The season typically begins with the Feria de Abril, during which there is a corrida every day, and runs through September. 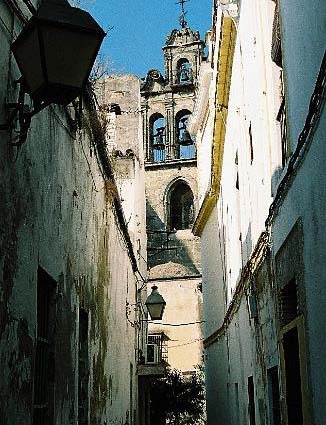 Bario de Santa Cruz, the old Jewish quarter is a great place to walk and feel Sevilla’s vibe. 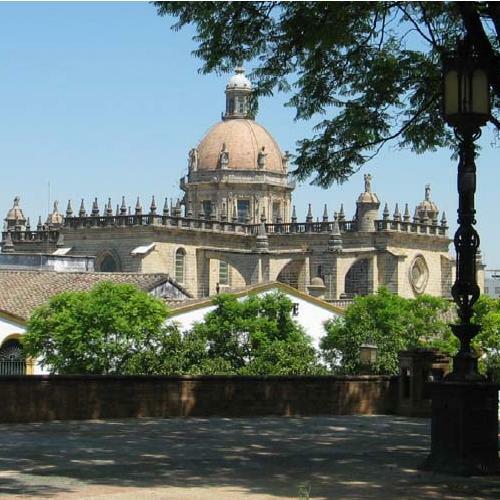 It has plenty of beautiful squares shaded by orange trees with numerous popular places to eat and drink. If you are in town during Semana Santa prepare yourself for the spectacle of your lifetime. No other city in Spain celebrate it with the same enormous afford; it shows the strength of Catholicism and tradition in Sevilla. You can find all the details and dates onwww.semana-santa.org. Then, generally two weeks after Semana Santa there is Feria de Abril – eating and drinking, crowds…then add dancing, toros and cheap carnival rides in place of all that religion! The Feria takes place on the other side of the river and breathes a little life into Los Remedios. Jerez de la Frontera beguiles with its eclectic mix of sherry, horses and flamenco. It is only 30 minutes drive north from Cortijo de Las Flamingos and Chiclana. Jerez is best known for giving its name to sherry, one of the most popular drinks in the world. Jerez offers a wide selection of bars and restaurants and a wonderful shopping experience in the main street, Calle Larga. The streets and walkways of Jerez are lined with orange trees and on every street corner you will see stacks of oak barrels representing the history of the city. The obvious place to start a tour of the old town is the impressive 11th and 12th century Islamic fortress – Alcázar. Inside are beautiful mezquita (mosque), converted to chapel, an impressive set of Baños Árabes (Arab Baths) and 18th century Palacio Villavicencio with impressive gardens. The Alcázar is open from 10am-6pm. The Alcázar has a superb octagonal tower (Torre Octogonal) and camera obscura in the palace’s tower which provides a picturesque live panorama of Jerez. There are many monuments worth visiting, not least of the entire Baroque Cathedral with its magnificent towers. The cathedral was built in 1700 on the ruins of an old mosque. It was built by the two brothers, Diaz de los Reyes in Seville style. The cathedral houses several important works of art. There is also a wonderful Archaeological Museum in the Plaza del Mercado. The museum is open every day except Mondays. Opening hours are 10-2 and 4-7 on Tuesday-Friday and 10-2.30 at weekends and on holidays. The museum is best known for the Greek helmet found in the Río Guadalete and the Bronze Age stone sculpture that are on display. The Centro Andaluz de Flamenco is located in Plaza de San Juan and is the most important museum and school of its kind anywhere.It is open 9am – 2pm Mon-Fri.
As with everywhere in Spain, Jerez has a fair share of fiestas, one of the most popular being the Horse Feria is (La Feria del Caballo). This takes place in May and features taming and riding competitions, trophies for the best horses and equine exhibitions. It is combined with one of the largest feria and funfairs in Spain. The next Horse Fair will be celebrated from May 5th to 12th, 2018 and it has already been declared an event with international tourist interest. So, it is only left to say: Do not miss the chance of visiting it! The Gonzalez Hontoria fair park becomes a town within another town and it is lighted as if a brilliant sun shined through more than 1,200,000 light bulbs with different colours. On first official day of the fair, at 22:00 you will watch a spectacular firework display which marks the start of a festival lasting 7 days. There will be more than 216 casitas. Fast 2,000,000 visitors in only 7 days backs up the prestige and it guarantees the resounding success of the Horse Fair each year. All this is assisted by an area covering more than 52,000 square meters for kids and adults to enjoy funfairs at this huge scene. At such a celebration, 500,000 wine bottles can be drunk in a week. Apart from a parallel program with the Horse Walk, you will daily observe attractions at several places, such as an impressive show performed by hundreds of horsemen and horsewomen. Sierra de Grazalema Natural Park is one of Andalucia’s most visited parks with its wildelife, rugged limestone landscape and great hiking territory. The Alcornocales Natural Park – gentle walking experience amid centuries-old cork oak woodland. The Estrecho Natural Park – prime spot for viewing the twice-yearly migration of birds between Europe and Africa. The Bahía de Cádiz Natural Park has one of Europe’s most important wetlands.